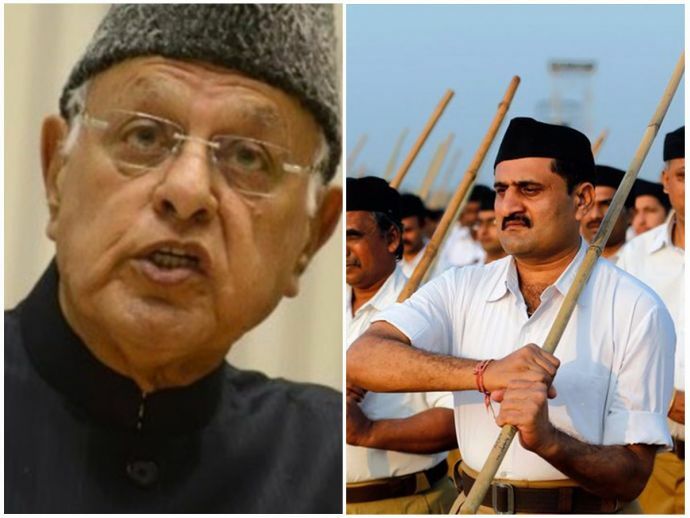 Farooq Abdullah, the National Conference parliamentarian is the one who was re-elected as party president and is currently accusing RSS of taking groups of youths to isolated places from villages of the valley, brainwashing them and training them as their agents. Abdullah was addressing a delegate conference of the party here in Srinagar in which he was re-elected as party president. Youth are being taken to New Delhi from villages like Kupwara, and then sent to Nagpur and brainwashed and trained to become the agents of RSS. Beware of that and keep a check on any such activity in your area. Now orders are passed from Nagpur and not from our state assembly. That RSS spokesperson Ram Madhav tries to be the point man on Kashmir. Mama Bana Hai Woh Kashmir Ka. Who is he? What does he know about Kashmir? Let him travel here without a bulletproof vehicle here and then talk. What is his position? We are secular and will be so and your force cannot suppress us. Abdullah is the former J&K chief minister and has also smacked New Delhi saying that they have never respected the sentiments and love of the people of the state.